Its time to test your English skills. In this Word Brain Teaser, some letters are given in the puzzle picture. Your challenge is to find the missing letter in the sequence which will replace the question mark. Can you solve this Alphabet Puzzle as quickly as possible? 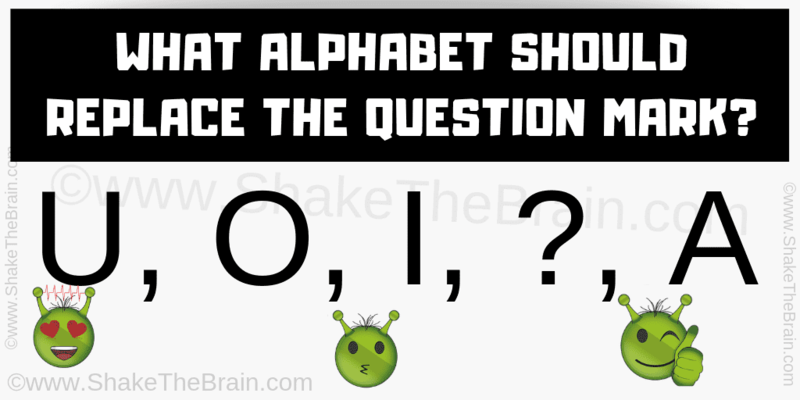 WHAT ALPHABET SHOULD REPLACE THE QUESTION MARK? Answer to this "Alphabet Sequence Puzzle for Teens" puzzle, can be viewed by clicking on the button. Please do give your best try before looking at the answer. The Answer is E. These alphabets are vowels.